I don't have as much traffic as RH blog. I write mainly to share my photography experiences and RH of course reports all problems and issues with his added opinions, measurebation, and spins on various reported issues and problems. He is the ultimate measubator and I am totally not. I respect him as a friend, but I don't agree with him on his untiring work in stepping down on Pentax. 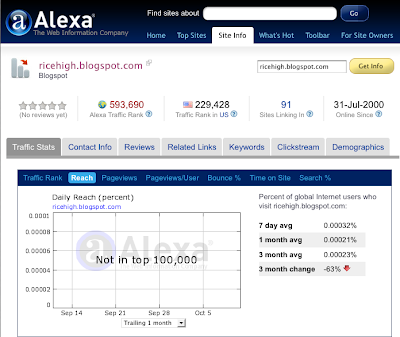 And in term of the site "popularity", mine is still the highest Alexa ranked unofficial Pentax dedicated site, amongst all the Pentax sites of different types, themes and natures (exclude forums but include all other information-sharing websites like the excellent K-mount knowledge base by Bojidar Dimitrov and those semi-official blogs like Ned's or Yvon's etc. (which I think Yvon's site is actually a commercial one as his books and related products are promoted and there are Ads whereas Ned's one is both semi-personal and semi-official)). I checked today based on a Mozilla Firefox plugin called Quick Search Status. I have surpassed RH blog by a margin today. It is too early to celebrate until I can confirm my Alexa ranking further. But here are what the plug-in reported to me in my Firefox browsing of my blog and that of RH home page. Just a tiny bit of success that I overjoy at the moment. I want to share my enthusiasm with Pentaxian. I can' beat RH in terms of his popularity but at least I can chip in to praise Pentax for what it is good at and the Pentax credits that are long due from its consumers and bloggers who value them fairly. And in my blog, I have included all other Pentaxian blogs that can share a fair view on photography along with Pentax gear, you can see all the Pentaxian blogs update and the list will only get longer as I am going to make more Pentaxians friends to share our concerted efforts in appreciating Pentax gear on a fair basis. RH has become a friend of mine and I do respect him as a good blogger and a kind friend to me in the blogging community. I was wrong about a month ago trying to wage a war with RHTrashyGreen campaign with trashy and insulting wording wanting to defend Pentax and its community to his onslaught of efforts seemingly stepping down on Pentax gear with issues and with much success in his popularity. His work in his blog does hold Pentax accountable to all the reported issues and known problems and we should consider that as a plus to certain degree to the Pentax community. We don't need to react with doubts and hate but rather let Pentax reacts to his reports to come out with another k-7 that is better than k-7, another k-x that can be more bold than the current k-x, and perhaps a 645D that an average Joe in us can save up for. Well for the latter, maybe in retirement bidding on impulse on a 645D parts-only-and-as-is and hopping our next generation as in my two boys have gotten a degree close enough to fix it up for HinTheMan in retirement. RH comments to me in my blog is exceptionally kind as we do share common interest in appreciating some of the Pentax gear in the past such as his Pentax F* 300mm f/4.5, Pentax K100D, and probably many of his precious babies -- the Pentax prime lenses. He is a unique person with a character we may not understand. It is quite difficult to be kind to him and his work but I will do my part to be open and treat him with honor and respect whenever I can. As I learned from his comments, this world can do better with less hatred but with friendship, warmth, and kindness. And before I end this blog post, I have a YouTube video showing how ugly that a fight can go and I vouch not to fight as in this Hong Kong movie, both superstars in Hong Kong were no longer with us. Instead, I will invite RH to enjoy the movie with me and we can engage our similar and yet very different approach and objectives in blogging with Pentax products. I invite my readers to be open minded and kind to RiceHigh as he has done that to me and others who are open minded. Congrats and keep up the good works! Btw, I'm sure you'll find more interesting subjects to write in the future. p.s. Since you have higher Alexa rank than me right now, I think your traffic is actually higher for those webmasters who have installed the Alexa Toolbar, at least in the past 3 months. p.s.2 I think your websites are more pleasant to read if there are no Ads (maybe just for me anyway). p.s.3 I like the photos you post in your photo blog (which I mostly lack :-))! @RiceHigh, thanks for the visit and suggestions. @street_vision, now I know the name of the movie "Enter the dragon." The guy playing the opponent with Bruce Lee in the movie was a popular movie and TV Kung Fu actor. In real life, he is a kind gentlemen and a good teacher among his peers in the younger generation. He was most famous for his unique laugh in playing a bad role in movie and Hong Kong TV shows. He was well respected in Hong Kong and if I have to pick a favorite of the two Hong Kong actors, that would be him instead of Bruce Lee. He lived a full life and died in earlier this year in the age of 96 with six children.